Dr. Michael Ho was born and raised in Los Angeles, California. His undergraduate education was completed at Yale University. He was awarded the Paul Sigler Memorial Prize for being the top student in Biochemistry. After completing his medical education at U.C. San Francisco School of Medicine in 2008, he finished his neurology residency training at UCLA, serving as chief resident of his class in 2012. He then completed an Epilepsy/Clinical Neurophysiology fellowship at Harvard Medical School/Massachussetts General Hospital in 2014. 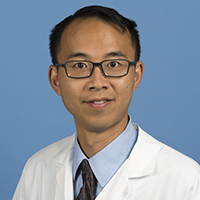 Dr. Ho's clinical interests are in epilepsy, normal pressure hydrocephalus, stroke, movement disorder/Parkinson's disease, headaches, post-hospital discharge follow ups, and general neurology. He is bi-lingual in both English and Chinese/Mandarin. Presenter at Massachussets General Hospital Neurology Grand Rounds Clinico-Pathological Case Conference “A 7- Year-Old Boy with Focal Seizures and Increasing Weakness,” February 21, 2013, Etherdome, Boston, MA.